Systems, Products, Installations, Film, TV, Theatre, Theme Parks, Training, Simulations, Testing, Tracers, Civilian & Military Devices. Engineering, Systems Control Effects, Steam, Vaporized Water, Jungle Haze for Zoos, Aquariums, Museums, Events, Billboards, Buildings, Defense-Security, Detection, Signaling, Pest Control, Riot Crowd Control, Air Flow Analysis. 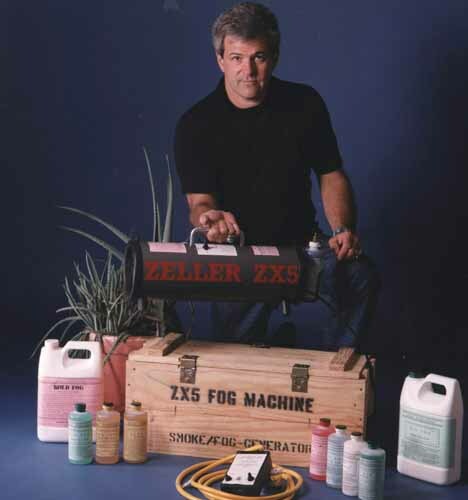 The liquids below are compatible in a wide range of thermal foggers,which are sold internationally, from inexpensive yard foggers to professional timer control machines.Our are used daily on Broadway, Soap operas, haunted houses, night clubs, by bands, tours, theme parks,and fire rescue T-G.
Zeller International's fluids have been used on numerous Broadway productions, operas, TV, commercials, feature films, children's theater,and around pets and individuals who are sensitive to smoke. Our compounds have been approved by Actors Equity, Screen Actors Guild, The Department of Defense, NYC Fire Department and independent experts. An established series of smoke agents consisting of non toxic comp media, fluids and a range of dense to light signature smokes for any form of training from black, grey to white. 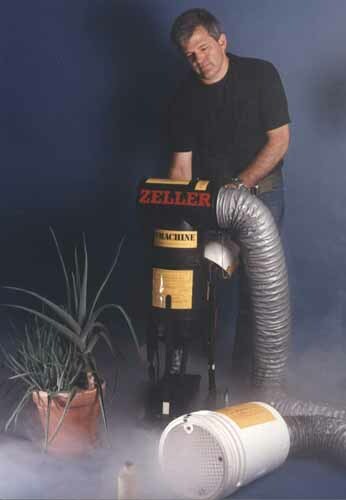 Zeller Internationals products are establised systems. Current comp charges are used in 37mm lauchers, 12 gauge dispersal loads and numerous field proven formulas based on non toxic chemistries. A broad product grouping for any form of delivery requirement on the water, in the field, in buildings, vehicles anywhere.